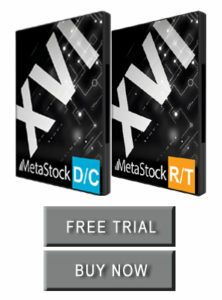 MetaStockAustralia.com is an authorised reseller of MetaStock . The MetaStockAustralia.com website is run by well known trader and author, Stuart McPhee. After using MetaStock for his own personal trading for nearly 20 years (since 1999), Stuart decided to share his knowledge of the software and its formula language with other fellow MetaStock users so they could enjoy the productivity and flexibility he enjoys. MetaStock is a full-featured, professional-level charting program. MetaStock was first released in late 1985 and in response to an increasing demand for a real-time version of MetaStock, MetaStock RT was released in July 1992. Since then, numerous versions of both the end-of-day and real-time versions of MetaStock have been released. MetaStock is now used by hundreds of thousands of traders in over 100 different countries, and has been helping traders for over 30 years – an eternity in trading software. scan thousands of securities within seconds, using the Explorer. create your own indicators, using the Indicator Builder. What’s more, with MetaStock’s own powerful programming language, the customization possibilities in MetaStock are almost endless. All prices listed here are in US Dollars. This product suite is targeted toward the individual investor and includes both real-time and end of day variants of the software along with data subscriptions, plug-ins and third party products. You can read some FAQs here. MetaStock is a product from Innovative Market Analysis – based in Salt Lake City, Utah, it was founded in 2013 by Scott Brown. Innovative Market Analysis acquired the MetaStock software line directly from Thomson Reuters on 1st May 2013. The company is responsible for supporting, developing, and programming the software as well as management of MetaStock customer accounts.